Switchgear modernization service is a cost-effective, brand-neutral solution to extend the life of you equipment. As switchgear reaches the end of its intended useful life, a viable, cost-effective strategy is to modernize the existing equipment with the latest state of the art circuit breakers. 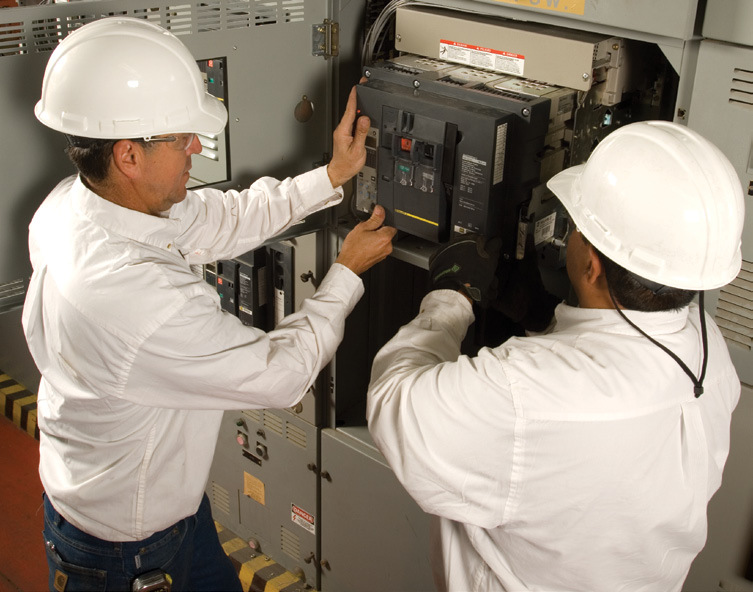 Our Switchgear Modernization Service offers cost-effective modernization and upgrade solutions that will expand the capabilities of your electrical system with minimal downtime. Our direct replacement and retrofill solutions utilize the upgraded technology of the Masterpact NT/NW insulated case circuit breaker for low voltage systems or the Magnum circuit breaker for medium voltage systems. Designs are available for ANY brand. We offer two modernization options that both provide improved power system reliability and lower life-cycle costs; Direct Replacement or Retrofill. One factor to remember is conduit placement. Installing new switchgear (which is usually smaller than the older/obsolete equipment it is designed to replace) requires that existing conduits above and below the equipment be moved. This time consuming and expensive process is eliminated with either our direct replacement or retrofill solution. Circuit breakers are designed to fit into the existing cubicle with little-to-no modification to the switchgear cell. Direct replacement solutions reduce downtime since there is minimal (if any) outage on the equipment bus. Designs are available for any manufacturer’s switchgear. The service is available for low can medium voltage. Low voltage — A standard Masterpact cradle is installed into an adapter cradle to form one assembly, which is then installed into the switchgear cubicle. (This cradle-in-cradle assembly locks into place and will remain in the switchgear cell after the initial installation). The new Masterpact circuit breaker racks in and out of the adapter cradle. A new door is installed, however cell interlocks, the racking mechanism and the switchgear structure are not modified. Medium voltage — The Magnum direct replacement circuit breaker will rack into the switchgear line-up and correctly interface with the existing compartment cell. The original racking mechanism, safety interlocks and the primary/secondary disconnects inherent in the original equipment design are maintained and the switchgear structure is not modified. The existing switchgear cell and bus are modified to accept the new circuit breaker. This option requires a longer bus outage (compared to the direct replacement option), during which time the internal circuit breaker cell is modified to accept the new circuit breaker. A retrofill solution is often used in lieu of the direct replacement option for larger devices, such as main circuit breakers and tie circuit breakers. Low voltage — Features a Masterpact cradle and circuit breaker, along with a new racking mechanism and primary and secondary connections in each switchgear cell. Existing cells are modified to accept the new cradle and circuit breaker, including a custom-engineered connection between the cradle and the switchgear line and load side bus. Custom designs are available for any manufacturer’s low voltage switchgear. For more information on the quality circuit breakers we install with this service, see our circuit breaker page below.